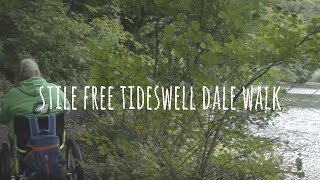 Tideswell Dale is a beautiful wheel-friendly route in the heart of the Peak District National Park – as accessTOG ambassador Debbie North discovered. Tideswell is a typical Peak District village with quaint shops and a magnificent church known as the ‘Cathedral of the Peak’. Our day began with coffee at The George Inn, which serves good pub grub. I was able to get into the pub in my wheelchair but there are no accessible toilets inside. The walk begins at the pay and display car park a short distance south of the village at Tideswell Dale (free to blue badge holders). There are toilets at the car park too (RADAR) and the footpath is clearly marked towards Miller’s Dale. The path meanders along the river, where there are picnic benches and seating. Watch out for some lovely sculpture along the way, and a picnic spot next to the footpath. The walk is very peaceful and there is an abundance of wildlife to watch out for. After a short while the path splits into two, so take the right-hand track. There are a couple of gates to go through but both are very accessible. This track brings you out on to a quiet road in Miller’s Dale, where the route takes you left to Litton Mill. Litton Mill was built in 1782 by local farmers Ellis Needham and Thomas Frith and became notorious due to its use of child labour. It was here that Robert Blincoe arrived as a child from a London poorhouse and wrote about the cruelty and terrible treatment of the mill workers – with children entering the mill never to be seen again. Litton Mill has been converted into residential apartments in recent years, but remains a stunning relic of the Industrial Revolution. The path follows the river to Cressbrook Mill past a limestone cliff that’s a popular spot for rock climbers. William Newton, probably better known as the ‘Minstrel of the Peak’, was the manager of the Cresswell Mill and showed much greater compassion for his workers than at Litton Mill. He built a school and a row of latticed windowed cottages that look down on the mill. The path continues over the bridge and out onto the road. A little further along the road is a car park, where our lift was waiting to take us to the top of Monsal Head for an ice cream. The ice cream van has been parked at Monsal head for several years – I should know, I used to visit it as a little girl with my grandparents 50 years ago! Unfortunately, the pub at the top isn’t wheelchair accessible but the views from here are amazing and well worth a visit. TOG VERDICT: Beautiful wheel-friendly route in the heart of the Peaks, with rich wildlife and a fascinating history to discover. Carpark: Pay and Display at Tideswell Dale (Free to blue badge holders).